Offering you a complete choice of products which include base jack welding machine, cup & lock welding machine, horizontal welding system, inner prop welding machine, mig welding machine and outer prop welding machine. 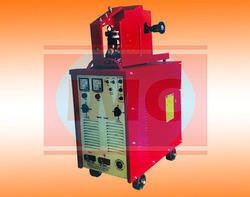 Base jack welding machine is designed to increase production and quality of welding on solid threaded bar and hollow threaded pipes with base plate of any size and shape and u-base of any size and shape, however the machine has capability to weld up to 1200 pieces in 10 hours of working shift , there is no need to make welding tag pipe or solid with base plate and u-base, on the other hand machine has the adjustments if any ovality comes in job. suitable from the length 300mm to 1000mm and sizes from 28mm to 48mm, length adjustment with screw drive. 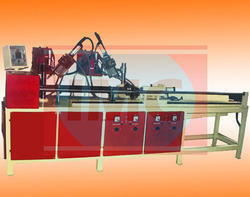 Horizontal ledger welding machine designed to weld ledger blades together at the same time, machine hold and weld the blades proportional to each other. 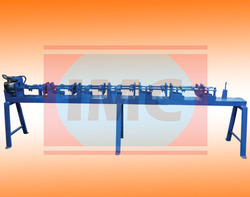 This unit is pneumatically operated for clamping the ledger blades with pipe and also the movement of welding torches, the machine has screw wheel drive to adjust the length from 500mm to 2500mm. As per own requirement. Machine itself has adjustments for different welding angles as 360 angle adjustments. Left to right adjustments & height adjustments available for better penetration. Automatic Ledger welding machine is used to weld ledger blades with pipe without making any joint between them, It gives high production and accuracy to product. 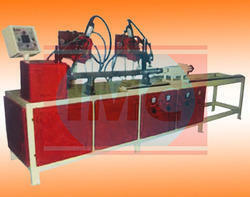 Ledger post are used with combination of Cup lock welding to make a structure. All the components are used in combination of each other. Base jack welding machine, Inner prop welding machine, Outer prop welding machine, Cuplock welding machine, Ringlock welding machine. Automatic Inner prop welding machine is used to weld base plate with pipe without making any joint between them, It gives high production and accuracy to product. 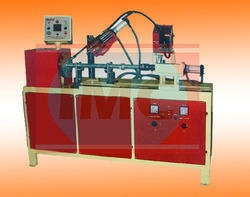 Inner prop is used with combination of Outer prop welding to make a structure. All the components are used in combination of each other Base jack welding machine, Inner prop welding machine, Outer prop welding machine, Cup lock welding machine, Ringlock welding machine. This system is based on circular welding on both base plate with pipe and pipe with threaded sleeve from both positions as from top side or inside of sleeve for fastest production and uniform welding and it helps operator be safe from burning skin of continuous welding process. This unit is base on 380 -415 volts 50-60 hz. Ac as input supply and control led with Siemens make plc system and motor drive, clamping of job and de-clamping is pneumatically operated for movement of welding torches. Automatic Outer prop welding machine is used to weld base plate with pipe and sleeve without making any joint between them, it gives high production and accuracy to product. 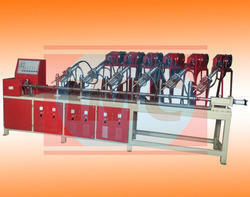 Outer prop is used with combination of Inner prop and base jack to make a structure. All the components are used in combination of each other Base jack welding machine, Inner prop welding machine, Outer prop welding machine, Cup lock welding machine, Ring lock welding machine. Cups and lock pins Tagging system is Designed to increase the Production and for proper placement of Cups and Pins as per Standard. 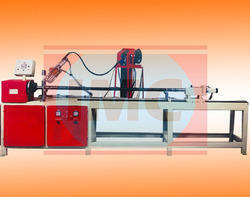 This unit helps in Aligning the Position of Cups to equal distance as 500mm. This unit is pneumatically operated for clamping and de- clamping of vertical Cuplock , we suggest making one tag on each cup and final welding on lock pins , Once Job shifted to Final Welding Machine, the job will be directly shifted to Painting section.